Food is political, emotional, educational, artistic, heart breaking, cruel, poisonous, disgusting, and delicious. It is a salvation, it is a test, it is a peace offering, it is a murder weapon. It is many things for many people. Some people eat too much, some people eat too little; depending on where you live in the world, the majority of people are either starving or they are obese. Food is extreme. Food is paradoxical. But one thing it is not, one thing it can’t be to any living being, is unnecessary. Food is survival. When I look at these works, I think of WWII. I think of my parent’s stories of growing up during WWII in southern Italy, in the face of destruction and starvation, stories I listened to while they fed me. I’m not the only one; the artists on these pages either lived these stories or heard them. And not just these artists, but all of us. WWII is part of our collective memory and our relationship to food comes from these memories of war, destruction, discipline, and survival. The paradox is that for us that were born after the war, we were raised with the stories told by our parents and grandparents while living in an age of plenty and excess. We were taught at the dinner table that food was precious. We were taught how to eat with manners, how to share, and how to not waste food. Some of us were taught how to garden and how to be self-sufficient while others of us were taught how to handle hunger and how to handle sorrow. And yet, we live in an age of tremendous consumer excess. Even more so now; food has become cool. We have celebrity chefs with their television programmes, cookbooks, product endorsements, newspaper columns and even art exhibitions. On Facebook and other social media sites, people post photos of their home-cooking and restaurant experiences. There are countless blogs about food and cooking and the successful bloggers are publishing cookbooks. People are singing praises for farmers markets, organic food and locally sourced products. Companies and marketers are embracing this DIY aesthetic and you see it in the clean-cut design, the rustic décor of chain cafes and restaurants. But food is more than cool. Our consumer culture can’t hide the fact that we live in an economically unstable period with political strife surrounding us. We are seeking to go back to our homes, to be able to face discipline and self-sufficiency. We want to find food nearby, we want to be able to cook for and nourish ourselves, we want to appreciate the simple things. We want to go back to the stories that we heard in our childhood and learn from them again. We want to prepare ourselves for disaster. M.F.K. 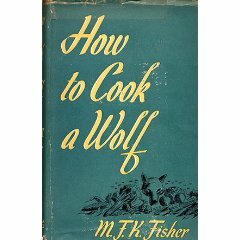 Fisher wrote How to Cook a Wolf in 1942 during the height of food rationing and propaganda in the US and serves as a how-to manual for keeping a semblance of enjoyment in the kitchen during war time. 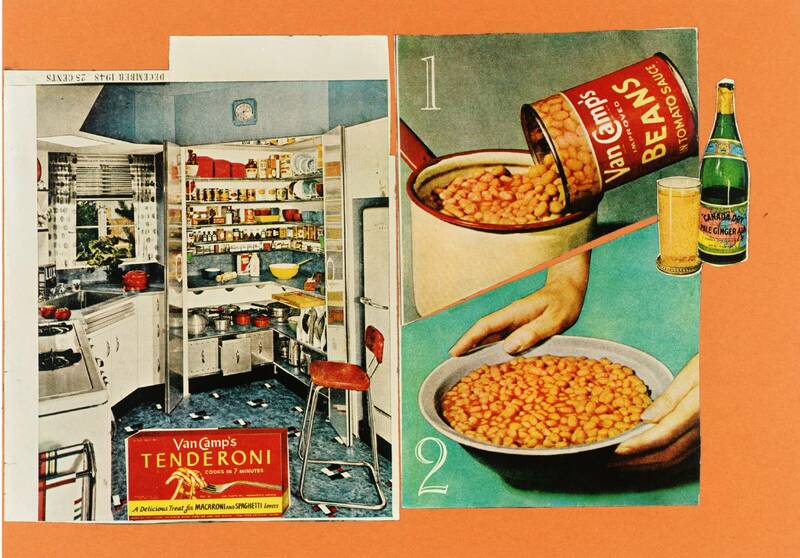 But by encouraging economy, discipline, foraging and improvisation, it also can be a manual for a dissident home cuisine in resistance to a homogenised food culture and capitalized kitchens. This exhibition is organised around the chapters of MFK Fisher’s book that serve as lessons on how to keep the wolf away from the front door. While not intended to be seen as a direct response to the lessons, the artworks in each section can be interpreted as juxtaposing the collective memory of war and austerity with the attempt at navigating a world of capitalist growth and consumption.